Horseradish is a natural antibiotic that works without any side effects and is used to treat various diseases. In the chemical composition of horseradish a substance called benzyloisothiocyanate – a mild form of a natural antibiotic – is present. It fights bacteria that can cause runny nose, cough, flu, inflammation of the kidneys, bladder and urinary tract. It stimulates the secretion of gastric juices, which significantly facilitates the digestion of heavy and greasy dishes. It is often used to fight nuisance cough, it is used in the fight against bronchitis, with anemia, digestive disorders, and as a good cure for rhinitis. In folk medicine, horseradish was used long before it was appreciated in the kitchen. The list of his healing activities is very long. The positive effects on the cardiovascular system, the prevention of scurvy and diuretic and detoxification properties should also be added to those already mentioned. Horseradish is also an excellent product for fighting pain. Its strong analgesic effect is used for neuralgia, arthralgia and bone pain. 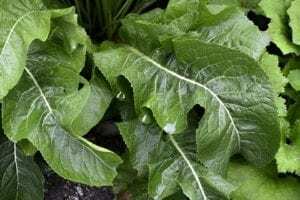 It is best to fight rheumatic pain using horseradish compresses – grated root or leaves of this plant. Horseradish, a plant from the brassicaceae family, also known as a brewery, is famous above all for its sharp, burning taste. In the horseradish root is contained a sulphurous glycoside sinigrin, which breaks down into the mustard oil. It is he who gives this spice its characteristic taste. First of all, it produces sodium isothiocyanate, which is a substance with antibiotic properties. In addition, it has a warming, disinfecting and expectorant effect. It also soothes the symptoms of infection. Glycoside also has fungicidal and bactericidal properties, thanks to which it is a natural preservative. In addition, sinigrin supports the digestive system, improves metabolism and the work of the gallbladder. Horseradish is also an excellent source of many valuable nutrients. It is very rich in vitamin C, B vitamins, pro vitamin A, potassium, calcium phosphorus, magnesium, iodine. In terms of its vitamin C content, horseradish exceeds popular citruses. At the same time, thanks to the fact that the root is hidden underground, the vitamin is perfectly protected against the effects of the sun, which causes its oxidation.